Northern Ireland (Irish: Tuaisceart Éireann, Ulster Scots: Norn Iron or Norlin Iron) is an small desolate land with little or no redeeming features. Rejected by both the Republic of Ireland and the United Kingdom it has been cast aside in exile. Disputes have been fought over it both sides hoping to do without the burden of this pitiful place under its control. It is linked to the main part of Ireland by a small bridge over the river styx but is owned by the United Kingdom which uses it as a detention centre for Asylum Seekers. Until recently it was mostly forgotten about and ignored by the other nations comprising the United Kingdom, but when they beat the England football team 1-0 in a World Cup qualifier in Derry, everyone suddenly remembered they existed and promptly declared civil war on it. This war is being bitterly fought at this moment. There is a divisive controversy over the name of Northern Ireland and in an attempt to approach this issue it is expected that the new name will be henceforth "One Land, Many Names". In order to realise the diversity of the land the name will be officially translated into every recognised language, further annoying and isolating each community. 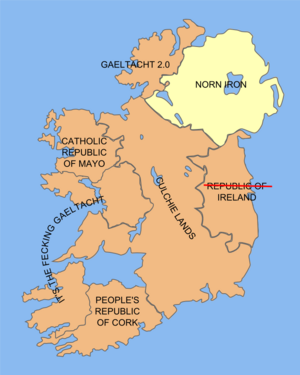 The name Norn Iron derives from Northern Irony due to the fact that the stupid bastards beat/bomb/shoot the crap out of each other for both being Celtic Christians who worship the same god slightly differently but support opposing football teams while the Moslems pour into the country without anyone noticing. The national food is Potatoes, the Pastie bap, ulster fry ups, young children, wild orphans etc. The national drink is Harp Lager or Buckfast or concorde for the "ladies". The country was formed in the year 1005 AD by an erupting volcano. The Delorean motor car was invented in Belfast, and was sold by the IRA to Lybians in exchange for Plutonium. The Orange Order are so called that because Burnt Siena Order was already taken. Abbey CBS (this article, despite a £12million grant, will not be complete until September 2008 at the earliest). This page was last edited on 2 October 2012, at 02:26.